A great way to drive traffic to your site is to connect with others through blogs and advertising swaps. Guest bloggers are a great way to get new, interesting content that people will come to your website to view. Popular and famous guest bloggers are hard to get, but hey why not give it a shot. You should also try guest blogging for others as it will allow you to sell your company and display expertise. Advertising swap is another easy yet great way to increase traffic as you and another site can trade banner ads. You should try doing this with a complimentary site whose company you frequently work with. Blog posts should be written for your business to be posted on your website; however, with that being said, your website does not have to be the only place your blogs live. Blogs can be posted on sites like StumbleUpon, ProBlogger, CopyBlogger, and Alltop (all sites for bloggers to post blogs and be discovered by other bloggers). Another good place to post your blogs is LinkedIn as this will help boost your profile within your industry. Sites like these can help you gain additional attention and drive traffic to your site. Your headlines are what initially draws viewers. When sharing blog posts via social media your headline will make or break your site traffic. Headlines should catch an audience’s eye and pique interest. If you do not have a compelling headline, then nobody will read your blog – no matter how amazing and well-written it is. This is the only tip on this list that involves investment, but it is also likely to have the strongest effect on website traffic. Pay per click ads are those ads that come up at the top of your Google search before all the other relevant sites. 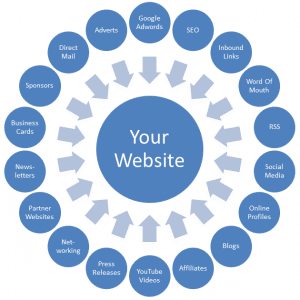 Your website is thus the first site viewers see and will often lead to more traffic. You then pay the search engine every time someone clicks on your site. This is a great way to get people to land on your site; however, you just want to ensure that you have a sleek, responsive site in order to keep the audience and seal the deal. Not only do you want a number of sites linking back to you, you want your own website to be linking back to you. Internal links are a prime opportunity to not increase site traffic, but rather retain site traffic. This can also help boost user experience and make site viewers happier and more likely to return to your site. LSI is similar to synonyms. Basically, you want to ensure that your website pages contain all relevant terms and phrases related to your topic rather than just a single keyword. This will ensure that more searches are directed towards your page as search engines are better able to identify the purpose of your webpage and thus direct more related searches towards it. These are just a few simple techniques to boost site traffic. The difference may not be magnificent, but it only takes a few extra viewers to score a customer. If you need additional help, then be sure to contact us at Omnibeat and we will gladly help you and your business.